What do you do when the weather won't make it's mind up, all the racists have come out in force and it seems like the country is f*cked? 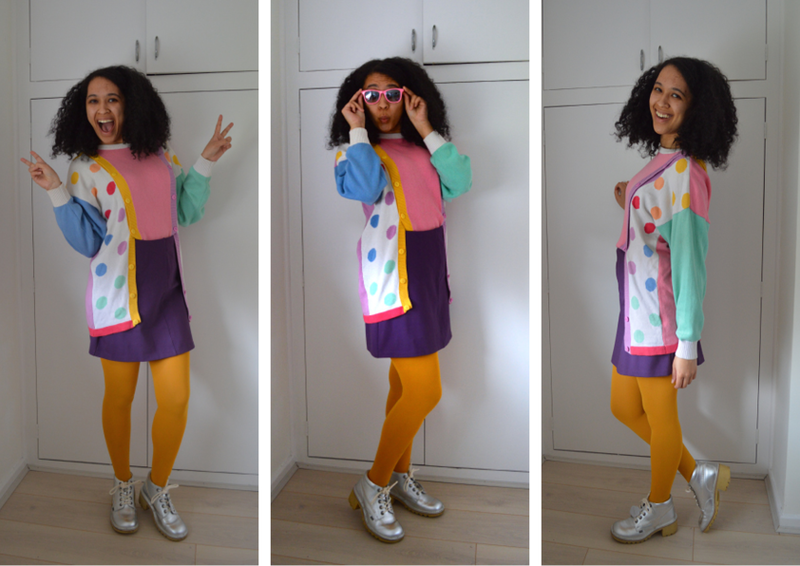 Why, you dress like a cartoon character/CITV presenter, duh. In all fairness, upon looking through these pictures I think the yellow tights might have been a step too far. We all make mistakes. But THIS JUMPER you guys - it's just absolutely everything. Snapped up from my friend's closing down vintage shop sale for a measly fiver a few months back, it's bonkers in the best, Lazy-Oaf kinda way. It buttons all the way up the middle and down the back so technically speaking, you could wear each sleeve separately with nothing in the middle. Bit risqué for me personally, so I've been unbuttoning it halfway and tucking the flap into a skirt to make for a layered cardigan look. Hello instant comfort. In my head I'm wearing this look on a low-budget TV set, pulling off a killer sequeway between the latest episodes of Pokemon and My Parents Are Aliens with a puppet on one hand and a sick trickz yo-yo in the other. Obviously I couldn't stop there, so I topped the whole thing off with my beloved silver Kickers, which are a hell of a lot more comfortable than they look. There's also surprisingly versatile - who knew metallics really were a neutral? But then again, when have I ever been bothered about neutrals - like some sort of sartorial Buckaroo (another 90s reference for you there), when it comes to me and colour, I say pile it on. If worst comes to worst, this jumper can always double for an impromptu Twister sesh. Dressing like a lunatic at a foam party is all part of my campaign to bring even the tiniest bit of sunshine into this dark world, which couldn't really feel more apt right now.